To Dream is Sonoma Scent Studio's new addition to its Boutique Collection of fragrances, and it was inspired in part by the line's previous release Lieu de Rêves. I purchased Lieu de Rêves when it was first launched, and I've been enjoying it so much — enough to include it on my personal list of favorite fall fragrances — that I was naturally curious about To Dream. Sonoma Scent Studio describes To Dream as "a comforting, dreamy but sophisticated and complex blend of woods, florals, incense, and gourmand notes," including violet, rose, heliotrope, cedar, amber, frankincense, oakwood absolute, vetiver, tonka, orris, vanilla, musk, sandalwood, oakmoss, suede, cocoa, and aldehydes. At first glance, that list reminded me very much of Lieu de Rêves, but as soon as I applied a bit of this newer fragrance to my skin, I noticed the differences. To Dream opens with a strong stroke of oakwood; it's a very aromatic note, with a distinctly wine-like character. Then the oakwood thins and softens a bit into the heart of the fragrance, which contains a dusky violet-rose-iris accord similar to the one used in Lieu de Rêves. This floral heart is framed by the fragrance's "complex woodsy base": there are some warm, cedar-y wood notes, and the vetiver and frankincense also make themselves known at this point. The late dry down of To Dream recalls Lieu de Rêves again, but with significantly less heliotrope, so that it never turns as powdery. To me, Lieu de Rêves feels more like a reverie, or the sort of dream I might have during an afternoon nap on a sunny winter afternoon, whereas To Dream is a bit darker and more complicated, like the dreams you can only have during deep night sleep. Sonoma Scent Studio seems to have carved out a micro-niche of woodsy-resin and woodsy-violet fragrances, and To Dream fits nicely into its existing catalogue; if you already love the floral heart of Cameo, or the cedar-and-purple-flowers effect of Wood Violet, chances are you'll also enjoy To Dream. It has a "classic" twist at its core, but its edges are still just raw enough to keep the fragrance feeling hand-crafted in the best possible way. Sonoma Scent Studio To Dream is available as 17 ml ($42 spray, $41 splash), 34 ml ($80), and 5 ml purse size ($20) Parfum. For buying information, see the listing for Sonoma Scent Studio under Perfume Houses. 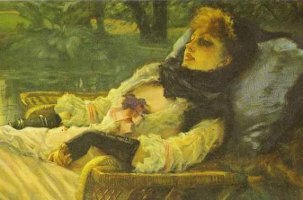 Note: image is James Tissot's The Dreamer (1871) [cropped], via Wikipedia. What a beautiful review of a beautiful scent, Jessica! You referred to SSS’s “micro-niche of woodsy-resin and woodsy-violet fragrances”, and since Laurie herself has already blogged about her upcoming fragrances, I don’t think I’m letting the cat out of the bag to say that the things in the works now are outside of that “micro-niche”. Her perfumes continue to be ever creative and ever more beautiful. Obviously I’m a huge fan of Laurie’s – both personally and professionally. I can confirm that the rumors are correct. This is one she started on last year, but RL intervened. She’s working on it again now. After that is a vintage inspired scent, which I’ve smelled some early mods of and it is gorgeous! She discusses these scents in more detail on her blog. Jessica, I love To Dream and it will be my first rose/violet combo perfume I feel compelled to own. I have said it over and over on numerous blogs but I adore Laurie’s creations and love that she let the perfumista community play a small part in making her lovely perfumes. I think she has such a kindred spirit and it shows in her work. Buying her stuff is a joy and I can’t wait for my tax return next week LOL I’m going straight to her site and ordering a FB of To Dream, Velvet Rose, Wood Violet , her Lavender Absolute lotion . Her new scents that are coming are next on my list too. Tamara – Don’t forget Cameo! If you like this violet rose combination, you MUST try Cameo. Second this! I find Cameo to be beautifully romantic. I love the craftsmanship put into all of SSS’s fragrances and this one is no exception. It’s as if young Lieu de Reves has matured over the last few years and become wiser and more worldly. Both are beautiful and suited to different moods and seasons. Thanks for the lovely review! Oh no OperaFan , is Cameo FB worthy??? Two perfumes I wanted to try Ambre Noir and Jour Ensoleillé are no longer available…I would probably love Cameo but sometimes the scents can come off pot-pourri like on my skin-Vintage Rose was that way unfortunately. I wonder if I could enjoy Egyptian Musk? See there is alot I haven’t smelled! Tamara, have you tried Rose Musk? This one is probably my favorite SSS’s rose (and Vintage Rose didn’t play nicely on my skin too). Lexford, that was my understanding, too. Jessica, thank you for the review. For me To Dream is also rather a night dream than a midday nap’s one. I enjoy wearing it to bed on my wrist. For some reason, the review of this had me thinking of Sacrebleu, but after looking up the notes I guess they are not much alike. How strong is the violet in this? I have a bit of a problem with the violet in Wood Violet, which goes a little metallic on me, although the violet in Voile de Violette works beautifully. I almost didn’t notice the violet at all in this one, especially compared to the two violet scents, but your mileage may vary. Agree – violet is more of an accent or enhancement note here than the more prominent role it plays in the other SSS fragrances, including LdR. I agree… the violet is one element in the heart, but not the major theme as it is in V de V.
Undina I have tried Rose Musk and something in the base wasn’t right on my skin…on to the next! Rose Musc did not work for me either – it could be that I am anosmic to a musk in there. It was all pale pink dusty rose in my experience, and made me feel down. I have tried a sample of To Dream, and I found the resemblance to Lieu de Reves to be quite prominent, although TD is woodier and darker. It didn’t really work well on my skin–it starts out fine, but after about an hour it develops a bitter note that I do not care for. Like all of the SSS scents, however, it is well-crafted and obviously of high quality ingredients. Tamara–I would suggest getting samples of all the SSS scents that you haven’t yet tried. You just never know–the ones I liked best weren’t necessarily the ones I expected to like from the lists of notes. Yes, as a rule of thumb, always orders samples first… from any line/house! Great review, definitely sounds like my kind of perfume! Any other suggestions? I don’t know much about the company other than what I’ve read on NST, though it gets a lot of love here! Voile de Violette and/or Wood Violet, if you like woody violets… Vintage Rose, if you’d like to try a plummy, woodsy rose… and Tabac Aurea seems to have many admirers. Seconding Tabac Aurea… it’s gorgeous! I will add these to my list and re-read some of the other reviews from the line . . . samples are so much fun. P.S. my budget is shoved under my dryer because I hate folding laundry. I’m very fond of two of her roses: Velvet Rose and Rose Musc. Love roses, will put these on my list – thanks! Jessica: Thanks for the review! I’m always glad when SSS gets attention on this blog. Laurie derserves all the praise she gets. Her fragrances certainly do have a distinct style. No one makes fragrances like she does – she’s a master of woods and incense as far as I’m concerned. I image someday people will be talking about the distinctive woody style of her fragrances much as people speak of other distinctive classic houses and fragrances, Guerlain, Caron, Dior, Chanel, etc. I am proud to say that I have both Lieu de Reves and To Dream. When I first tested To Dream, I thought wow – what a difference. It was like Lieu but more sophisticated, more polished. I thought immediately of Leslie Caron in Gigi – no longer in young girls clothes. Just picture that goregeous white and black evening gown and you get the picture. The extra woods and green notes -oakwoods, frankincense, vetiver, etc, in To Dream are so sophisticated and keep the structure very well blended. The development is exceptionally smooth. It’s not as wild as Lieu de Reves which always makes me think of blustery spring. They do smell similar but are definitely different. I can’t wait to smell what she releases this summer. I think she is on a roll. I already have 9 SSS fragrances, and I’m sure I’ll be adding more soon enough! AnnS, you are a SSSuperfan! Thanks. Trying my 2.5ml spray sample of To Dream today – it is gorgeous. I did not care for Lieu de Reves, but it seems Laurie noted on her blog that To Dream is working for several people for whom LdR did not. That might be me! Yeah, he picked up on them! I’m guessing that people who found Lieu Reves a bit too sweet and pillowy may very well enjoy To Dream. LdR was too powdery for me. I find myself really enjoying the focus on woods in TD. Thank you for the review, Jessica! I’m looking forward to trying this. Thank you for the review – it sounds lovely. I am a bit behind with Laurie’s scents – I have many samples, just kind of abandoned them. She does do really nice work. I don’t know much about this line yet but obviously I have to try this one! It sounds really different and beautiful, and I love the aroma of oak. Do check it out when you have a chance… they’re sophisticated scents, but wearable, and the prices are very reasonable!